The Benchmark MyFuge Mini Centrifuge brings you quick convenient spin downs right at your personal workstation. This mini centrifuge is small enough to fit in your hand, while still delivering 6000 rpm and 2000 x g of force. The MyFuge personal centrifuge is a breeze to set up, with a simple click and lock instant rotor attachment, and quick speed up and wind downs, decelerating in one second. This whisper quiet minicentrifuge is a handy gem to have nearby without being a distraction to those around you. 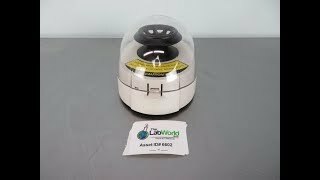 This Benchmark MyFuge Mini Centrifuge C1008 has been thoroughly inspected and is performing to expectations. All of our lab equipment comes backed with our standard warranty. Should you have any questions, please don't hesitate to contact us.